Heat oven to 400°F. Grease cookie sheet with shortening or cooking spray. In large bowl, beat granulated sugar, 1/2 cup butter, the buttermilk, vanilla, egg and 2 ounces melted chocolate with electric mixer on medium speed, or mix with spoon. Stir in flour, baking soda and salt. On cookie sheet, drop dough by rounded tablespoonfuls about 2 inches apart. In 2-quart saucepan, melt 2 ounces chocolate and 2 tablespoons butter over low heat, stirring occasionally; remove from heat. Stir in powdered sugar and hot water until smooth. 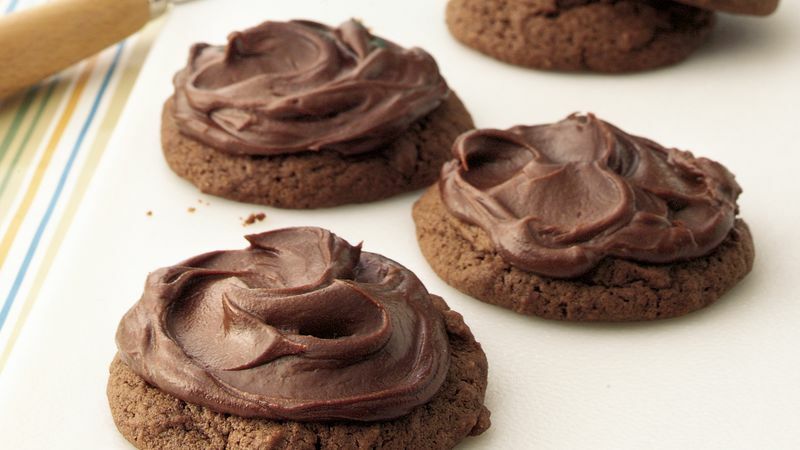 (If frosting is too thick, add more water, 1 teaspoon at a time. If frosting is too thin, add more powdered sugar, 1 tablespoon at a time.) Spread over cookies. Unsweetened baking chocolate contains 50 to 58 percent cocoa butter. Bitter in flavor, it's used primarily in baking. You'll find it in the supermarket in a rectangular box containing packages of one-ounce squares or bars. Frost cookies with a container of your favorite flavor of Betty Crocker® frosting. Store cookies in a baking pan with waxed paper between layers of cookies.